This world-class wines is the result of the amalgamation of the most exuberant grape variety, the most self-minded terroir and one of the most skillful wine producers in Alsace. Hengst in Wintzenheim is a terroir on cold, oligocene marl which gives acidity and focus, and the extremely sunny and dry microclimate allows the grapes to mature gracefully under the clear October skies. 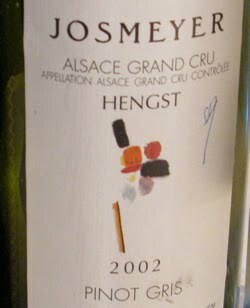 2002 Pinot Gris Grand Cru Hengst has a complex aroma of ginger, exotic spices, honey, apricots and wild flowers. The taste is full and ripe with a superior structure, zesty acidity and sweet dry fruits that create an aftertaste that lasts forever. Marvelous! Price: €25.